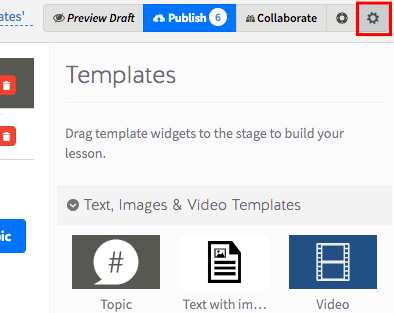 From within a Lesson, click on the settings cog to open the settings for that Lesson. This forces the user to move through the lesson tile by tile. They won't be able to proceed to the next tile until they've seen the previous tile. All of the other tiles should be visible in the tile list, but disabled (greyed out or appear opaque). NOTE: If you're on any of the current Coassemble plans and you don't want to use the 'lock-step' feature you don't have to. Although students can skip checkpoints they are still required for course completion and the student will have to go back and complete them regardless.